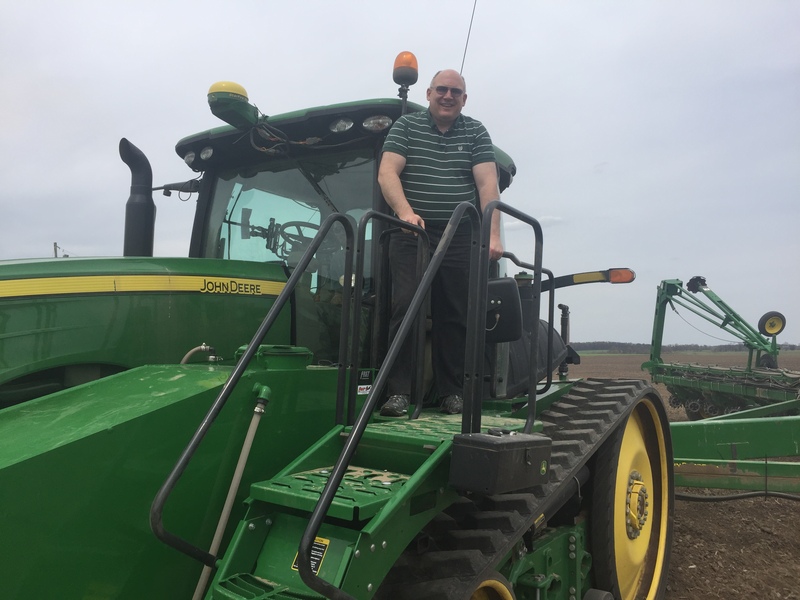 Direct from "Silt-Loam Valley" FBS's new Director of Development, Dr. Martin Traviolia, gets to "play in the dirt" with a first-hand view of high-tech corn planting. The FBS team is firmly grounded in farming so we've never out-sourced our software development, support or sales departments. We not only speak your language, we live in your world! 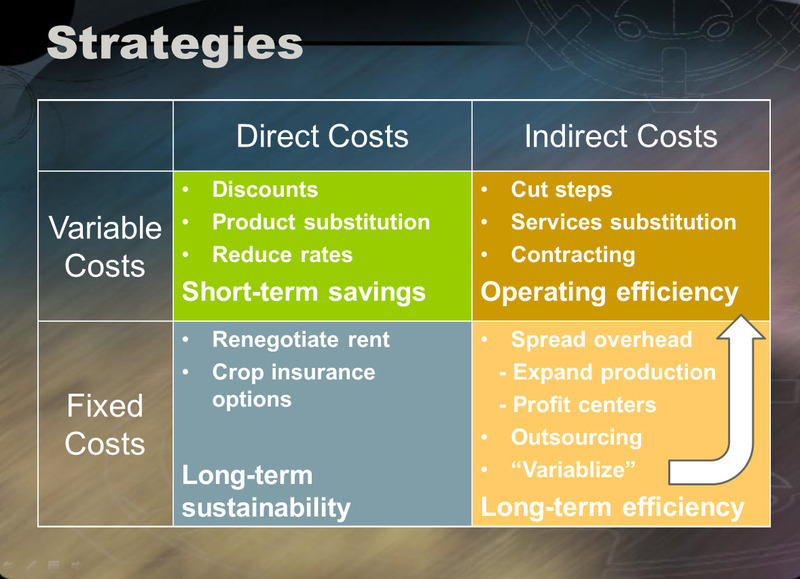 Opportunity Cost Accounting cost reduction strategies. Last month we considered four classifications of costs: fixed, variable, direct and indirect. In this installment of Opportunity Cost Accounting we’ll encapsulate strategies for driving down costs and reducing risks. Direct variable costs such as crop inputs receive the most attention in the farm press and coffee shop because they’re the largest segment of production costs, are relatively easy to measure and are subject to “comparison shopping.” The strategies for cost reduction are tried and true: volume purchasing, off-label or generic products, reduced application rates, switching to less cost-intensive crops. While significant costs savings are possible, keep in mind every other sharp manager is likely following this same practice. Keep in mind that while reduced out-of-pocket spending is easy to measure, the hidden costs of lowered production are harder to determine. Indirect variable costs that include fuel, labor, hourly machine rent and flex land rent require a little more analysis. The strategy here is to increase operating efficiency either by lowering outlays for these indirect costs, increasing production with the same investment, or both. It’s possible to accomplish a few short-term “tweaks” in labor or machine hire by cutting steps or employing cheaper alternatives; however most of the opportunities for reducing indirect variable costs are long-term (switching to contract labor or renegotiating flex rents). 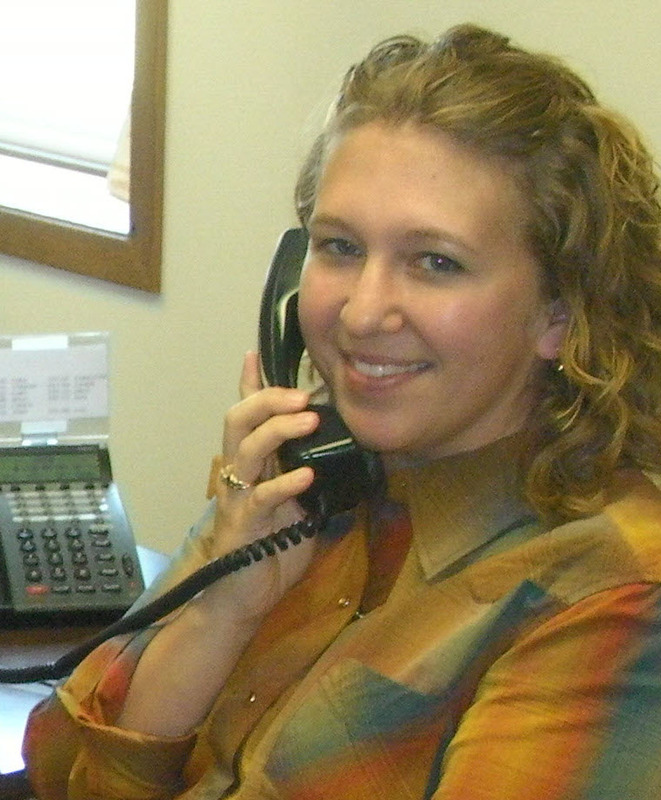 Direct fixed costs encompass cash rents, crop insurance and real estate taxes. Most of the emphasis these days is to renegotiate or walk away from unsustainable cash rents that were so willingly bid up in more exuberant times. Various crop insurance options provide out-of-pocket premium savings but may not be the best alternative if claims are likely. Unfortunately, real estate taxes are uncontrollable. Spread fixed costs over more output. Many operations are high-cost producers because their overhead (general & administrative, management team, equipment and facilities) is oversized for their production base. However, if they are able to efficiently replicate their management and control processes over expanded acres or animals then they can drive-down overhead per-unit costs. Turn excess capacity into a profit center. An alternative to internal growth is to allocate fixed costs to external services like custom farming, trucking or scouting, spreading overhead over more units and reducing production risks by diversifying. Outsource services is the mirror image of the previous strategy. You negotiate with a neighbor or business that will perform services like spraying, harvest or trucking more cost-effectively than you can and you shed excessive equipment and labor. “Variabalize” fixed machinery costs (particularly combines) by leasing. This has been one of Financial Consultant Moe Russell’s recurring themes at the FBS User Conference. Once you’ve exhausted the obvious cost-cutting strategies—squeezing input suppliers, coming hat-in-hand to landlords or living off of depreciation—it’s time to turn to discover the untapped opportunities hidden in fixed costs. 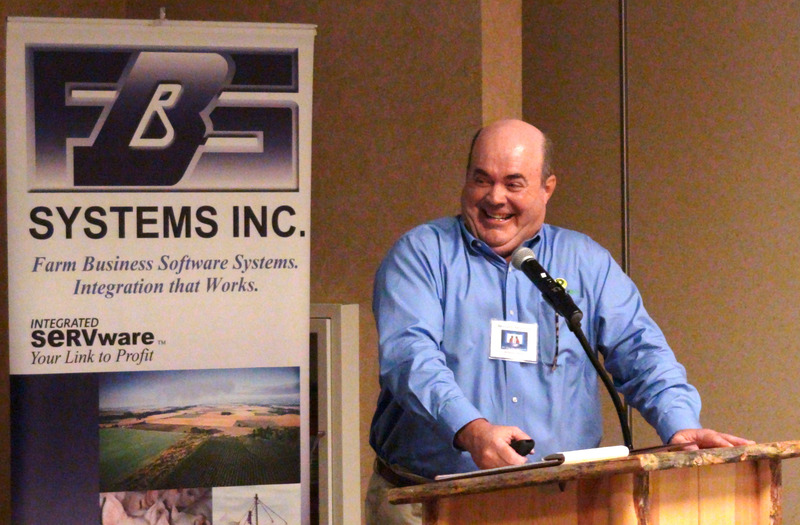 “Equipment cost is the second-largest line item expense for most grain producers next to land,” says Chris Barron, Farm Journal Top Producer columnist and Iowa farmer. Not only are equipment costs significant, they also vary widely from farm to farm. Studies by Moe Russell and John McNutt from the LattaHarris CPA firm have revealed per-acre machinery costs ranging from $44 to $400. "There still is a fixed cost out there no matter what you do, so the incentive is to go out there and get the variable cost covered and eat into the fixed cost," says Gary Schnitkey, a University of Illinois economist. Nonetheless being aware of aggregate overhead, labor and machinery costs is not the same as managing those costs or understanding in which activities you are efficient (and should expand to drive down costs) and in which ones you are inefficient (and should outsource). We’ll explore ways of evaluating these opportunities next time. May 2: Basic TransAction Plus entries. May 9: Basic Crop Audit entries. May 16: Basic Smart Feeder entries. 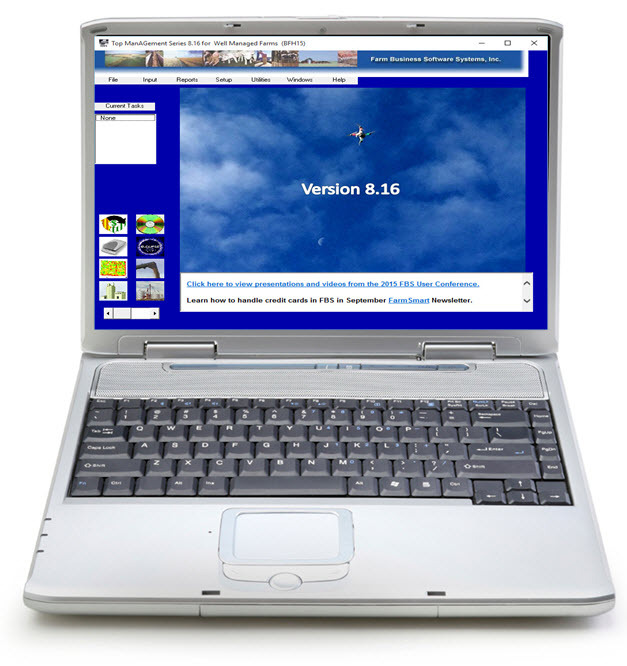 May 23: Personalize FBS with Preference, color and menu options. Q. 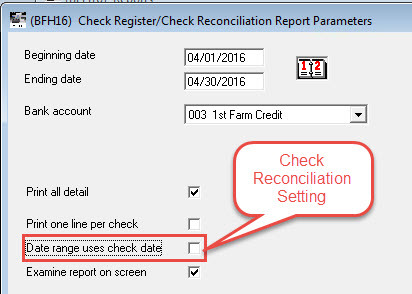 Why does my Check Reconciliation Report beginning balance for April not match my ending balance for March? If I run the report for January through the end of April the beginning and ending balance are correct, but when I run for just April both are incorrect. A. The issue is most likely due to uncleared checks and deposits recorded prior to cleared look-back months setting. TransAction Plus gives you the ability to set how far back to search for uncleared checks and deposits. The default value is four months. This means that any checks and deposits that are not cleared after four months will be considered void if the Check Reconciliation report begins searching more than four months after the check date. 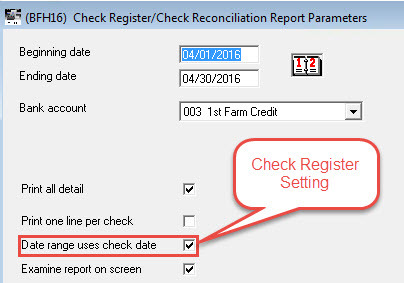 If the check is still a valid check you can change a preference to extend the uncleared look back period to 12 months if necessary. I recommend confirming your bank’s policy for uncleared checks before changing the preference. Many banks will not cash a check that’s older than 6 months. To change the Cleared Look Back Months Preference go to Utilities>Set Preferences> Cleared Look Back Months and enter the value in that you require.